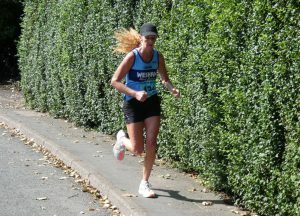 Carmel Sullivan came in 4th woman and 27th overall in the fourth Pilling 10k on Saturday morning in 46:45 in the fast 6-miler Over Wyre, winning the W50 category. Alan Hudson also returned to winning ways to take the M65 title in 49:39 following an operation to cure breathing difficulties, finishing 32nd overall. Wesham had three runners in the last of the Harrock Hill series on Wednesday evening. Paul Gregory completed the 5.3-mile and 900ft of climb in 42:01 to gain 45th place and 10th M40. Elliot Costello finished 102nd with a good run in a time of 47:42, and Nigel Shepherd was 4th M60 and 105th overall in 48:11. Alan Taylor set off on his Three Peaks +Cycle Challenge for Ben Ashworth on Thursday in aid fo Rosemere Cancer trust accompanied by John Collier, Chris Moss and John Rudd with driver Alex Rowe with a successful ascent of Ben Nevis in good weather conditions. Four days of cycling followed in varying weather conditions with some tough riding over Rannoch Moor then skirting Glasgow into the Southern Uplands and around Carlisle into the Lake District. He climbed Scafell on Tuesday in warmer conditions and on to pass through Preston on Wednesday with Nigel Shepherd for a night at home. He continues with two further days cycling for the final ascent of Snowdon on Saturday, then having completed 470 miles of cycling (14,000ft of hills) and over 11,000ft of mountain walking. Kath Hoyer ran the Tour of Norland Moor fell race on Sunday and she finished 1st W55 and 4th woman in 45th place overall in 54:38 for the 10k distance and 800ft feet of ascent. There was a good turnout of 187 in the Pennington Flash 5-mile trail race on Sunday with 400m on the Leigh Harriers track before heading out onto the Flash. There was a good standard in the race and Steven Gore finished 35th in 33:07, 9th M35. Vicky Gore was Vicky Gore finished 31st woman and 9th W40, 143rd overall in 45:20 with a chip time of 45:08. Nigel Shepherd ran his 60th parkrun and his debut at Lytham Hall to run a swift 20:17 for an M60 age graded performance of 79.05%. Jason Blagden timed in at 21:28 for M45 66.54% and Jonathan Lawson 21:57 with an M50 grade of 67.20%. Elizabeth Johnson clocked 26:47 for W35 56.75%. Peter Rooney ran 27:26 for an M55 grade of 57.96% and Diane Blagden had 27:55 with a W50 61.55%. Graham Cunliffe ran 27:59 for M60 58.31% and Julie Rooney 29:29 with W40 53.36%. Chris Pike ran the St Helens parkrun with 28:25 for M40 49.15%, slower than of late. Paul Carter ran his debut at the Cuerden Valley run with 30:34 for M45 47.49%. Martin Bates was a First Timer at the Pendle parkrun in Colne, clocking 29:07 for M60 55.58%. Dave Marsland travelled to Lancaster for the run in Williamson Park where he clocked 25:24 on the hilly course for M60 64.24%. In the Blackpool Stanley Park run Sean Murray ran 22:56 for M35 57.49% and Robert Brown 24:56 for M60 64.91%. George Kenned had 26:17 with an M60 grade of 61.00% running with Suzanne Leonard with W45 62.27%. Kim McGuire ran 30:46 for W60 62.19%. James Birchall was a parkrun tourist at the Llanerchaeron run in Aberaeron near Lampeter West Wales along the old railway line, where he ran 29:18 for an age grade of 44.08%. James Mulvany ran the 2nd fastest time of the day in the Fleetwood run with 17:32 for M40 77.85% and an age group best time. In the new Ford parkrun in Ulverston on a twisting 3.5 lap course grass David Taylor also had the 2nd fastest time of the day with 19:23 for 66.90% with Steven Gore running 21:28 for M35 62.19%. Megan Gore ran a JW11 47.66% with a time of 34:54 with Vicky Gore a second behind in 34:55.